No one survived the sinking of HMS Black Prince and no one saw her sink yet there are many accounts of sightings just before she met her end in pitch darkness in the middle of the night - sightings made possible by the fact that she was ablaze from end to end and drifting helplessly in close proximity to other ships. There have been many conjectures about what really happened to Black Prince on the night of May 31st. At the time, many relatives of the lost crew were angry and a story was circulated that after the ship was hit, the Captain was ordered to return home. He, however, had wanted to stay and fight but in her crippled state, Black Prince soon became an easy target for the German Fleet and was easily destroyed with the loss of all hands. After the Great War, however, historians were able to access German records containing more realistic accounts of what actually occurred. Black Prince was an armoured cruiser belonging to the First Cruiser Squadron under the command of Rear Admiral Sir Robert Arburthnot. Sailing with her were Defence, Warrior and The Duke of Edinburgh which was to be the only survivor of the Squadron. During the battle which followed their arrival on the scene, Black Prince seems to have lost contact with the remaining British Fleet; she was last heard of at 8.48 when she sent off a signal to say there had been a submarine sighting. It was beginning to get dark by now and so much was happening that other British ships had no time to look out for her. So we look to the German account which says that just before midnight, the Black Prince approached the German lines, possibly thinking their outlines were those of British vessels. At some point, the Captain seems to have realised his mistake and ordered his crew to turn Black Prince round but by that time he had been spotted from the German battleship Thüringen which immediately switched on its powerful spotlights and opened fire. 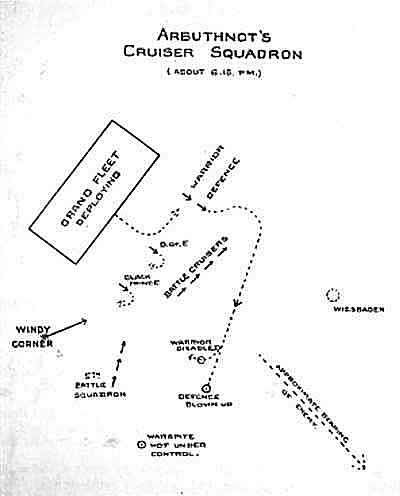 There were five more German ships all within a range of 1000 yards and all of them joined in the bombardment. "We were just recovering from our ramming match with the German cruiser, and most of the ship's company were collected aft, when suddenly there was a cry from nearly a dozen people at once: "Look out!" At first sight she appeared to be a battle cruiser, as her funnels were so far apart but afterwards it transpired that she was the unfortunate Black Prince with her two centre funnels gone. Soon afterwards, soon after midnight, there came an explosion from the direction in which she had disappeared."